Variety reports that this has been given the green light. Which comes on the three-inch heels of this: "Margin Call," another Wall Street-related film in the midst of production, starring Kevin Spacey and Jeremy Irons. Speaking of Pacino, don't these Tony Montana lines sound like they could come from a big swinging evil hedge fund manager (as well as from a big swinging coke dealer with a scar on his face and blow on his nose)? 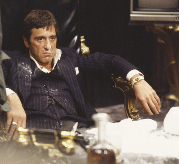 Tony Montana the hedge fund manager: Who put this thing together? Me, that's who! Who do I trust? Me! Tony Montana the hedge fund manager: You know what capitalism is? Getting BLEEPed! Tony Montana the hedge fund manager: This is paradise, I'm tellin' ya. This town like a great big BLEEP just waiting to get BLEEPed. Tony Montana the hedge fund manager: You wanna waste my time? Okay. I call my lawyer. He's the best lawyer in Miami. He's such a good lawyer, that by tomorrow morning, you gonna be working in Alaska. So dress warm.